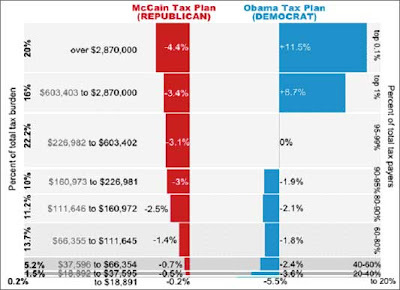 Blogger Jon sent me this web-based tax calculator, based upon the Tax Policy Center's take of Obama's plan. The Tax Magic Eight Ball will make most (but perhaps not all) ABH readers as cheery as it made me. For you whose household income is over $500,000, it says, "you will probably not get an Obama Tax Cut." For my bracket, it says something which may be interpreted as "Hooray! A DHC-2 Beaver float plane is in your future." A tax cut for the middle class and small business owners. Hmmm. As the chart above shows (from the Freakonomics Blog), returning to a progressive federal income tax is the sure path to a balanced budget. Hahaha! Anything's possible. Another difference between Obama and McCain: isn't it more fun to day-dream about paying less taxes than wonder what foods Halliburton will serve in DHS detention camps? The tax cuts won't happen. The only reason Bush will withdraw the troops is because he will need them at home to oppress the masses...that is...unless Bush really thinks the troops should be as far away as possible because they and the national guard couldn't be counted on to be loyal during a suspension of the constitution. with music playing over loudspeakers "happy, and peppy, and bursting with love"
I didn't say the tax cuts would actually happen! Just that it's nice to dream about them.